At of this point in the Pittsburgh Penguins season, they have played 56 games. 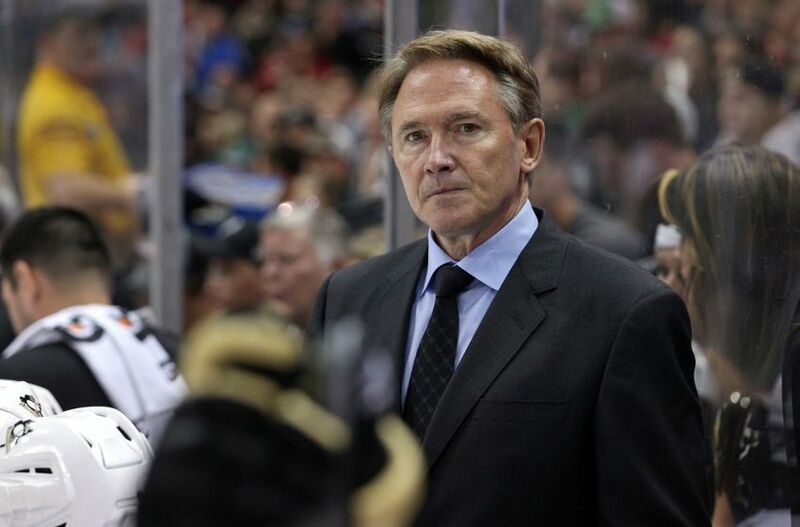 Exactly 28 of those games were played under Mike Johnston, and exactly 28 of them have been played under Mike Sullivan. This is the perfect chance to begin comparing the 2 coaches. I have been clear from the start of Sullivan’s debut: he was, and still is, the better coach even though the Penguins started 0-4 with him behind the bench. I understand it is extremely easy to look at the record of 2 coaches to compare them, because the record is the stat that matters. In this case, both coaches produced an identical amount of points (33) in 28 games, which would put them both on a pace of about 97 points in an 82 game season. So basically the Penguins now are just a little more exciting, but they’re the same right? WRONG! The biggest stat that favors Sullivan in this case is man games lost. The Penguins only suffered 54 man games lost under Johnston. The only significant injury was to Eric Fehr, who everyone knew would not start the season with the Penguins due to an elbow injury. Under Sullivan, they have had 109 man games lost, including injuries to Bonino, Fehr, and Malkin long-term. In addition, in Sullivan’s last 14 games, the Penguins are 9-3-2, good for 20 points and on pace for 118 points in an 82 game season. Johnston in his last 14 was 6-5-3, good for 15 points and only 88 in an 82 game season. In Johnston’s argument, Sullivan got to work with Daley as opposed to Scuderi, which definitely helped the offense. Also, although Rutherford also traded Perron and Clendening for Hagelin, he has not been doing much more than Perron, so I do not see this as a notable difference. Sullivan’s Penguins not only have the PP clicking, but it has scored 5 more goals than Johnston’s Penguins in 11 fewer opportunities. To give you an idea on how big that increase is, a 15.6% PP in the NHL right now would rank 28th of 30 teams. On the other hand, the 23.6% PP would have the Penguins tied for 1st in the NHL with the Washington Capitals. 1st!! Luckily for the Penguins, the PK has remained a constant. It is currently 4th in the NHL, and it was right around there when Johnston was fired. Despite Sullivan’s Penguins technically having a .1% better PK, this one is pretty even. Johnston did not have Fehr, a great PK guy, for the first month of the season. That being said, Sullivan has also had to deal with injuries to Fehr and Bonino, both solid PK guys. Clearly, the advantage goes to Sullivan here. He has really opened things up as head coach of the Penguins. The stars are producing the way they should, and the Penguins are beginning to score goals like everyone thought they would at the beginning of the season. Sullivan has really helped the Penguins establish an identity, and by goodness it seems to be working. In the NHL right now, Sullivan’s Penguins would rank 6th in goals for per game (despite some significant injuries), while Johnston’s would rank 28th, keeping in mind he had Crosby, Malkin, and Letang healthy for almost every game. This is one stat that absolutely does lie in Johnston’s favor. He had them playing a very defensive-style 200 foot hockey game, and this led to keeping teams in check. Also, Fleury was playing out of his mind early in the season (more on that later). Although I am not advocating for the fact that Sullivan’s Penguins are allowing 2.679 goals against per game, which would rank them 18th in the NHL, they are playing how the Penguins should be playing. This team is built to win 4-3 or 5-4 hockey games with their offense, not 2-1 hockey games with their defense. Their defense is okay but it isn’t anything special. Johnston wins this category for sure, but Sullivan’s style will naturally lead to this number being higher than Johnston’s. But note that despite the increase in goals against per game, Sullivan’s Penguins are scoring .179 more goals than the opponent per game, while Johnston’s were only scoring .036 more goals than the opponent. My point here is that whether the final score is 5-4 or 2-1, it still goes down as a win if the Penguins score more goals than the opponent, which has been the case more evidently under Sullivan than Johnston. In today’s NHL, this stat will never necessarily be a great one, but Sullivan’s Penguins have been better trailing after 1. Johnston’s Penguins put up 6 points in 10 chances (.6 points/game), whereas Sullivan’s Penguins put up 9 points in 12 chances (.75 points/game). This stat obviously hurt Johnston because the Penguins were not scoring goals during his time with the Penguins (for the most part). So when they found themselves in a hole, it was harder to dig out of. That being said, Sullivan has gotten the scoring going, and has led them to a better record in this regard. Once again, this stat favors Sullivan. His team has been much more resilient than Johnston’s Penguins, who had a very hard time coming back in games. If I remember correctly, they were something along the lines of 0-19-2 in this category last year. Again, although 3-7-3 (9 points in 13 games, good for .693 points per game) may not look great, considering the situation, this is actually quite an incredible accomplishment, especially in today’s NHL where scoring is generally down across the entire league. I want to clear up that I did NOT count games for either coach when the Penguins were down 1 goal and then an empty net was scored to make the deficit 2, because counting these type of games depletes the point in the statistic. Anyways, once again, advantage Sullivan. Johnston’s Penguins were often down and out if they as simply as allowed the first goal of a game. If the Penguins allowed the first 2 of a game or trailed by 2 at some point, the game was over. Sullivan’s Penguins are just different. As I mentioned earlier, they have found resilience, and hold a 4-7-3 (11 points in 14 games, good for .786 points per game). Johnston’s Pens did not record a win in this scenario. I want to specifically site the 3-2 OT win against Florida about a week or 2 ago. The Penguins were down 1-0 for almost the entire game, and then the Panthers scored a goal shorthanded mid-way into the 3rd period. It seemed like it was the dagger into the heart of the Pens, and it WOULD have been under Johnston. However, even with Geno out of the lineup, the Penguins stormed back in the final 5 minutes, tied the game, and won it into overtime. Meanwhile, we were all happy if the Penguins could just get the next goal if they gave up the first one under Johnston, yet alone the first 2. Kunitz’s numbers have not quite doubled, but they have certainly increased, especially his goal-scoring. Notably, Kunitz’s +/- has been ridiculously good under Sullivan. So good that he is currently 5th in the entire NHL in +/-, behind only Kuznetsov, Toffoli, Kane, and Kopitar. Great to see Kunitz looking slightly more like the Kunitz of a few years ago. At the beginning of the season, I was wondering what had happened to Kris Letang. I thought for sure he would be a top 5 candidate to win the Norris Trophy as the NHL’s most valuable defenseman, and meanwhile, early on it seemed like he was lucky to play in a top 6 role. Letang put up a horrendous -12 and scored only 1 goal in 25 games. Although defenseman do not score all that often, a guy of Letang’s caliber should have more than a goal through 25 games. This showed under Sullivan, where he is averaging more than a point per game and has 8 goals in 4 fewer games while posting a +4. He has been looking much more like the Norris candidate Letang that I expected to see at the beginning of the year. It’s no coincidence that Sidney Crosby has become vintage Sid again, producing at a ridiculous 1.334 points/game clip, which is surprisingly just above his career average of 1.331 points/game. He is benefiting from Sullivan’s system. Sullivan’s focus is to let the stats do what they do best and score/possess the puck, which opens up the game for the Penguins. When things open up, Sid is the best in the business and he has shown that with recent play. Johnston had Sid playing a 200 foot game and had him focusing entirely too much on defense. His defensive metrics spiked last year because of this. I believe that although Sid’s production was way down under Johnston, the process he went through made him more aware/responsible in his own end and made him a better player. That being said, under Sullivan, he has found his offensive touch again, but is still showing signs of good defense with his +9 as opposed to his -6 under Johnston. Clearly Fleury and his backups had the better statistics under Johnston, and I think this is partially due to 2 things: 1) I believe Fleury was in another universe early in the season. He saw the puck like a beach ball, and I think we all knew he couldn’t keep his stats up as high as he had them. 2) The Penguins were a more defensively structured team under Johnston, and so they had a tendency to favor defense rather than offense, which allowed for the defense to help Fleury out and reduce some high quality chances against. Under Sullivan, Fleury in particular has a 2.5 GAA and a .914 save percentage. However, his career averages are a 2.57 GAA and a .912 save percentage. So really, Fleury has been playing like his “normal self” under Sullivan. This also shows you how well he was playing in the beginning of the season when he boasted a 2.2 GAA and a .927 save percentage. That being said, the goalies stats were better under Johnston. Corsi: Corsi can be calculated by adding up a teams shots on goal, missed shots, and shots blocked by the opposing team. Corsi for % is simply just Corsi for divided by the total Corsi registered by both teams in a given game, or in this case, 28 games. Johnston’s Penguins had a Corsi for % of 48.3, which ranked 22nd in the NHL during his tenure as head coach. This also means that the Penguins allowed the other team to attempt more shots than them, which normally goes hand in hand with possession, which is why Corsi is such a popular statistic in hockey. In other words, Johnston’s teams were getting out-possessed in a general sense. Sullivan’s Penguins, on the other hand, have a Corsi for % of 54.0, which ranks 2nd in the NHL since he took over as head coach. Pretty impressive turn around, huh? Fenwick: Fenwick is an extremely similar stat to Corsi. The only difference is that Fenwick does not include shots that get blocked by the opposing team. Johnston’s Penguins had a Fenwick % of 48.2, which was only 25th in the NHL. Sullivan’s Penguins rank 2nd in the NHL during his tenure with a Fenwick % of 53.9. From 25th to 2nd?! Yeah, that happened. Shooting %: Although the Penguins have not been a very good shooting % team all year, they have been better under Sullivan. The Penguins had a lowly shooting % of 7.7 under Johnston, which ranked 26th. The Penguins are still only shooting at 8.3% under Sullivan, but the number is still improved. One big reason I think Johnston’s number was so low is that he preached shot volume, and getting shots early. When I got to talk to Mark Madden, he brought up the fact that often times players would just through low quality shots on goal just to get the shot volume that Johnston desired, and it was definitely something that I sensed. That being said, I do not sense that as much from the Penguins under Sullivan, and it has showed by increasing slightly. Heck, the Penguins are actually averaging MORE shots on goal per game under Sullivan (34.6) than Johnston (30.6). High danger scoring chances for %: This stat kind of backs my argument that Johnston’s Penguins would just kind of “shoot” sometimes. If his team was getting high danger scoring chances, it should show in this stat. That being said, the team ranked 15th with 49.1%, meaning that the Penguins’ opponents had more high danger scoring chances. Sullivan’s Penguins are 4th in the NHL in this category with a for percentage of 55.1. Corsi: Johnston’s Penguins did manage to break the 50% barrier in this category with a 50.2% Corsi for when they were down by 1 goal. That being said, it ranked 26th in the NHL. Sullivan’s Penguins rank 10th in the NHL with a 56.3% Corsi for when down by 1 goal. This is positive to see, as it shows that the Penguins are getting more shots to the net than their opponents when they are losing in a game, giving them a better chance at a comeback. Advantage: Sullivan…what else is new? Fenwick: Once again, Johnston’s Penguins remained about the 50% clip with a Fenwick % of 50.1, but it only ranked 26th in the NHL. Sullivan’s Penguins did not improve dramatically, but they moved up to 16th in the NHL with a Fenwick % of 53.7. Definitely not the biggest change, but a change that favors Sullivan nonetheless. Shooting %: This is one of those random stats that happens to favor Johnston. The Penguins had a shooting percentage of 8.2 under Johnston when down 1, but even that only ranked 19th. Sullivan’s Penguins rank 26th in the NHL with a terrible shooting percentage of 5.9. Both coaches did not really produce a number to brag about, but Johnston has the edge. % of offensive zone faceoffs vs. defensive zone faceoffs: Once again, Johnston’s Penguins were able to keep this number above 50% at 51.1%, but it only ranked 22nd in the NHL. Sullivan’s Penguins increased that number somewhat significantly to 55.3%, but it only ranks 16th in his tenure. Although the rank did not increase by much, Sullivan’s Penguins absolutely improved here. High danger scoring chances for %: Credit to Johnston, the Penguins remained about 50% in this category as well, coming in at a 52.9%, good for 14th in the NHL which is absolutely respectable. That being said, Sullivan’s Penguins have boasted a high danger scoring chances for % of 59.8, which ranks 4th. Sorry, Johnston, you were outdone again. High Danger scoring chances differential: Johnston kept the Penguins in the positive end of the differential with a +8, meaning that they were generating more high danger scoring chances than their opponent when down by 1. They ranked 12th which, again, is pretty respectable. But…sorry Johnston, Sullivan outdid you again. His Penguins have a differential of +35 when down 1, which ranks them 3rd in the NHL. Credit to johnston, but Sullivan still improved the Penguins in this category. Corsi: Johnston’s Penguins once again put up a Corsi for % of 54.8, which seems pretty respectable. That being said, it was ranked 25th when down by 2, as the tendency is for teams to kick it up a notch offensively when down by 2. Sullivan’s Penguins are much better at a 61.8 Corsi for %, which ranks 8th in the NHL, and it shows from all of the comebacks Sullivan’s Penguins have had while down 2 goals. Fenwick: In this case, Fenwick tells us a lot about the 2 different teams. Remember, Femwick is the same thing as Corsi, but without shots that were blocked. Johnston’s Penguins plummeted down to a 43.7% which ranked 24th in the NHL. Sullivan’s Penguins, on the other hand, boast a 61.8% Fenwick, which is 5th in the NHL over his coaching tenure. This tells us that the Penguins under Johnston panicked when down by 2, and simply flung pucks on goal from everywhere that often got blocked. It’s the only explanation for having a Corsi for % of 54.8 and a Fenwick % of 43.7. Sullivan’s Penguins, on the other hand, remained constant, meaning that they are getting shots through when down by 2. Shooting %: This stat is so simple, and yet so telling about the resiliency of both of these Penguins’ teams. Johnston’s Penguins had a pitiful 3.9 shooting percentage when down by 2, which ranked 29th of 30 NHL teams. Sullivan’s Penguins on the other hand boast an incredible 11.9 shooting percentage, good for 2nd in the NHL. Wow. Just wow. I just find that extremely fascinating, I really do. % of offensive zone faceoffs vs. defensive zone faceoffs: Johnston’s Penguins once again held what seems like a decent percentage of offensive to defensive zone faceoffs at 54.4%, but it ranked only 25th in the NHL. Meanwhile, Sullivan’s Penguins are in the offensive zone 2 times out of 3 when down 2, with a 67.2% rate of offensive to defensive zone draws, which ranks 2nd in the NHL. High Danger scoring chances differential: Johnston’s Penguins low high danger scoring chances for % led to his team’s differential to be a -8, which ranked 28th in the NHL. Sullivan’s Penguins kept the differential positive, posting a +9 which ranks them 13th. Again, a sign of a resilient team. For those of you that actually made it all the way through, I really hope that you have come to the realization that Sullivan is not just some coach that is the same as Johnston, or that he is just some fill-in kind of guy…he is the guy for this organization going forward. That being said, I do not want to make it seem like Sullivan is the Christ. He has been behind the bench for 28 games and hasn’t produced the greatest record, and I acknowledge that. All that I wanted to get at is that he really is the guy, and you should feel not good, but great, about him moving forward. Same record means same coach, right? WRONG!!! Just as a side note, all of the stats used in this article were either calculated by hand myself or retrieved from war-on-ice.com.